UPDATE: Diligent experts have identified these tunes as “Down Yonder” (first side), and “The Waltz You Saved For Me” (second side). Thank you, for your great assistance, Messrs. Chalfen, Johnston, and Bosch! Here’s another home recording that I found along with that old time fiddle one, it features two very familiar sounding, and quite enjoyable piano solos whose names I cannot seem to place. I’m hoping someone out there can help me identify the names of the pieces being played. If any of you treasured readers out there can put a name with them, I’ll update the article with special thanks. 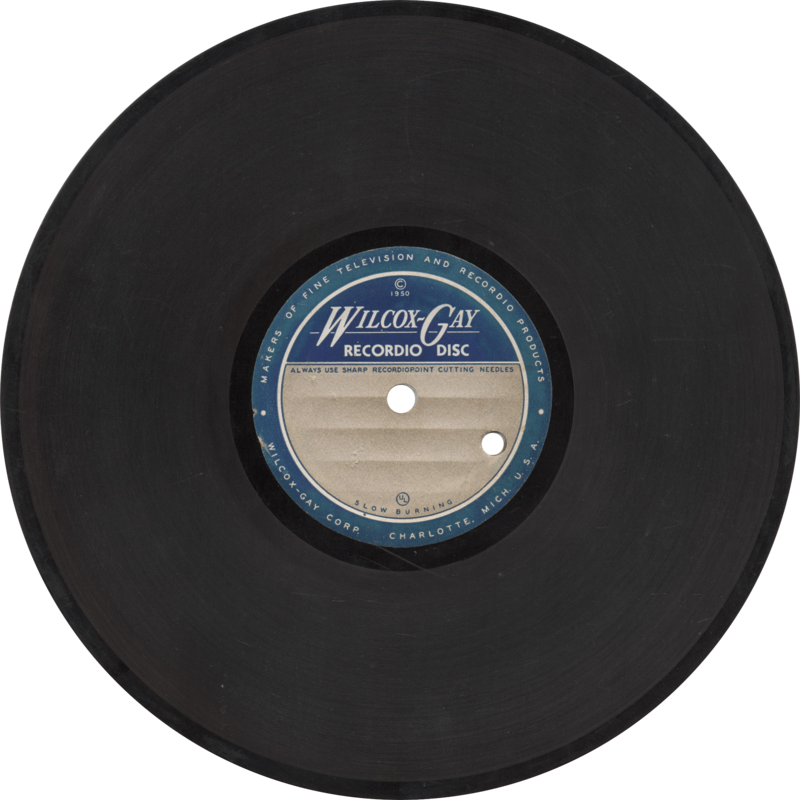 This Wilcox-Gay Recordio home recording disc is completely unmarked, making it impossible for me to offer any information on its artist or date. The copyright date of 1950 would likely place it in that vicinity as far as dating goes. As is often the case with these home recordings, sound quality is on the low end, and there is quite a bit of noise, but these aren’t too bad, all things considered. This side sounds especially familiar to me, but I just can’t put my finger on the title. At first I though it was “Waiting on the Robert E. Lee”, but it doesn’t seem to quite fit that tune. Thanks to a reader’s identification, this tune seems to be L. Wolfe Gilbert’s 1921 composition “Down Yonder”. Down Yonder, recorded ? by unknown pianist. This little ditty, too, sounds quite familiar, but again, I just can’t quite think of the title, if I ever knew what is was called. Some talking can be heard in the background of this one at one point. The Waltz You Saved for Me, recorded ? by unknown pianist. 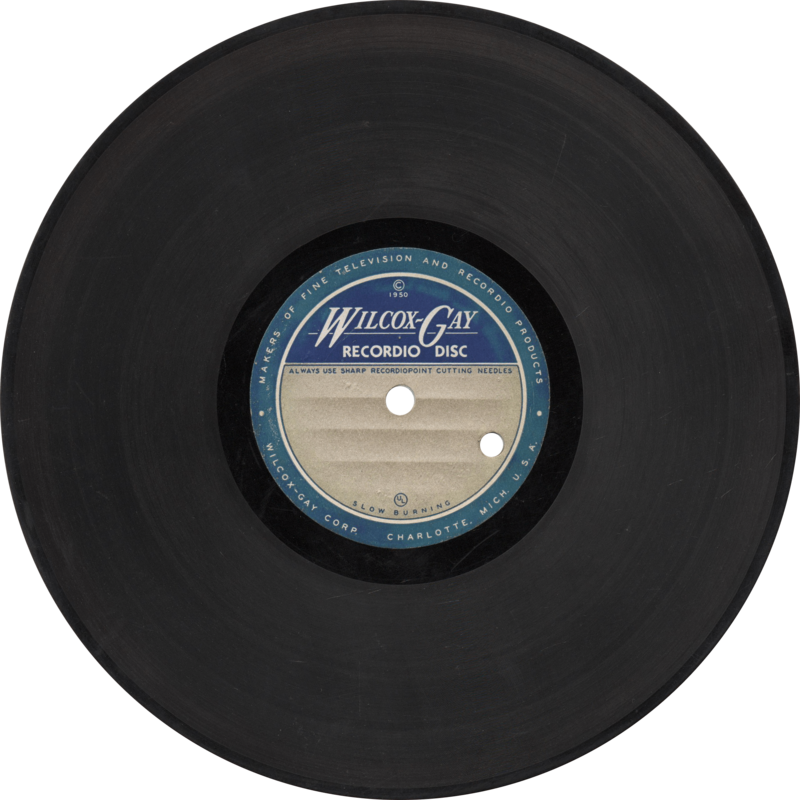 This entry was posted in Records and tagged 1950s, Home Recording, Piano, Ragtime, Texas, Unknown Artist, Wilcox-Gay by R. Connor Montgomery. Bookmark the permalink. The first side is “Alabama Jubilee” i do believe. Thank you kindly, I have added that information to the post. I could immediately tell who the pianist was upon the first listen, as I have a very similar disc in my family collection. The player is none other than my great-grandfather who on the disc in my collection recorded these pieces in 1951, as well as a handful of other sides. His name was Willard Eveland, and he lived in Illinois. He would’ve been around 50 at the time.